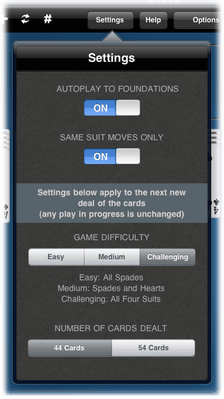 The implementation of Spider in Solitaire Plus includes the Easy, Medium, and Challenging variations. See the rules below for more details. Similar games in Solitaire Plus include Simple Simon, Scorpion, Scorpion II, and Double Scorpion. • A tableau of 44 cards in ten piles, with five cards in each of the first four piles, and four cards in the remaining six piles. • The top card of each pile is face up, the rest are face down. • Any or all of the cards on the top of a tableau pile that are built down in value may be lifted as a unit to be built elsewhere. • On clearing away cards above a face-down card in the tableau, the card is turned up and becomes available for play. • A space made by clearing away an entire pile may be filled by any available card or build, as long as the build is built down in value (or descending suit sequence if the SAME SUIT MOVES ONLY switch is selected). • Whenever play comes to a standstill, tap on the stock pile to deal another row of ten cards, one upon each pile of the tableau. All tableau spaces must be filled prior to such a deal. • The object of play is to assemble thirteen cards of a suit, from King to Ace, in descending suit sequence. • Whenever a suit is so assembled on the top of a tableau pile, you may lift it off as a group (by dragging the King) and discard it in an unoccupied foundation pile at the top of the game window. • It is not compulsory to discard a suit when able. • The game is won when you discard the entire two decks in eight batches to the foundations. Tap the Settings button to choose the game variation. The variations include the Easy/Medium/Challenging selections, 44 or 54 card deal selections, and a switch for allowing only moves of builds of cards in the same suit. Tips: Prefer builds in the same suit where choice offers. Among builds that are not of the same suit, start with those of the highest rank. Try to make a space as early as possible. Sometimes this will mean that, having depleted one pile, your prospects are better to continue removing cards from that pile rather than making other builds of the same suit, where the choice is offered. Use spaces to reorder sequences into descending suit sequence so far as possible, before finally filling a space. Avoid filling the space with a King unless it can be quickly discarded to the foundation. If you are able to build all cards in descending rank from King to Ace, then it is always possible to reorder the cards in descending suit sequence and move them to the foundations to win. Scoring: One point for each card moved to a foundation, plus one point for each card in descending suit sequence in the tableau. Maximum score is 104. Statistics are tracked separately for the Easy, Medium, and Challenging play variations. Chance of Winning: Varies with the difficulty level selected. The Challenging option with same suit moves is approximately 1 in 3 games with skilled play and a 44 card deal. In contrast, the vast majority of games (if not every game) with the Easy option should be winnable.